We moved into our house over five years ago. And as is the usual problem with moving into a new space, a lot of the stuff we brought with us doesn't quite fit in the house. We don't have nearly as many shelves, so we have a lot of knick knacks boxed up, unhung artwork, etc. 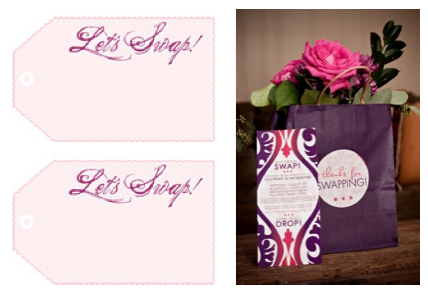 If you have a lot of boxed-up miscellaneous items, including old party goods, a swap party is a fun way to get rid of them. And if "getting organized" is one of your new year resolutions, this is the perfect time to do it! 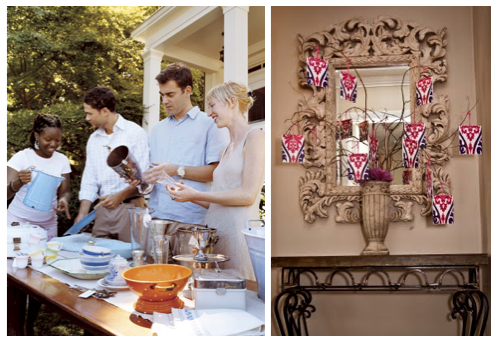 Here are a few tips to putting together a Home Decor Swap Party. Start off by sending guests an invitation that sets the tone for the party. I found these cute "Let's Swap" tags (above left) you can download free here. At right, I love how Christi of P is for Party gave her Swap Party invites a boutique feel, so people didn't feel like they were going to a garage sale. And she went the extra step of customizing bags with labels for guests to hold their things. Although her's was a clothing swap party, the bags are still a good idea to hold small items like candles. Make sure you have enough tables set up. I would recommend at least three tables where people can display their items. Vases and framed items can be propped on the floor. Let people mingle for the first half hour while items are being set up. Then distribute numbers to all guests. The number determines when they get to "shop." Out of consideration, a person should only take the number of items they came with. Whatever is leftover can be donated. You can have guests pick a number out of a hat or I love Christi's idea–she made the tree above right. Guests picked an envelope with a number inside off the tree. Makes the tree functional and a nice party decoration. 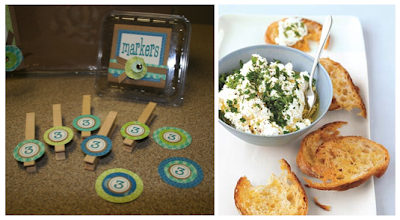 Give guests stickers with their names on them, or use this cute clothespin idea, to let them "mark" their items. Finally, anytime you have any sort of get-together, you need to serve food. Serve easy, non-messy finger foods that guests can eat quickly while they "shop." I would have loved to come to a party like this. When we moved here I had a TON of stuff I just stored in the basement. I finally gave it to goodwill last year... I was so tired of it taking up closet space! I haven't gone to anything similar to this, but I'm sure it looks like fun! I can't wait to have one in our new home in Hawthorne at the Park. Please Sir, Can I Have Some S'Mores? ?